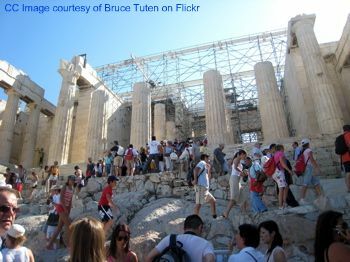 "Athens Acropolis – learn why everyone rushes to visit Acropolis Greece, home of the Athens Parthenon dedicated to Athena Goddess"
The only problem with world famous cultural sights like the Athens Acropolis is this: we have a feeling we’ve seen them before. 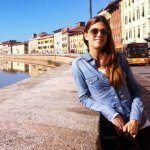 Throughout our life we’re being bombed with images of the famous Athens rock: we’ve seen it in the text books, art monographs, postcards, travel brochures… and not to mention that the Athens Parthenon, the most important temple on the Athens Acropolis, is the most copied building in the world. That’s why when we finally get to the real Acropolis it all looks somewhat familiar. We kind of almost take it for granted. To avoid this and to really appreciate the majesty of Athens Greece attractions like the Athens Acropolis, it helps to put it into an historical perspective. First of all, think about this: Athens Acropolis was first inhabited 5000 years BC. And now think that the Parthenon, Propylaea and Erecheteion were all built 5 centuries before Jesus Christ was even born, and discovering America sounded like the wildest science fiction story. And they’re all still standing up for you to see to this day! But apart from that, besides looking at its physical appearance only, when visiting the Athens Acropolis, you will be visiting the symbol of many things important to Western Civilization in general. Acropolis Greece is where some of the famous myths took place, earliest cults started, democracy developed… it is a place that has been inspiring the world for two and a half millennia, a symbol of free spirit, philosophy and architecture. Dining-room table tidbit: The Athens Acropolis was also known as Cecropia, after the legendary serpent-man, Cecrops, the first Athenian king. 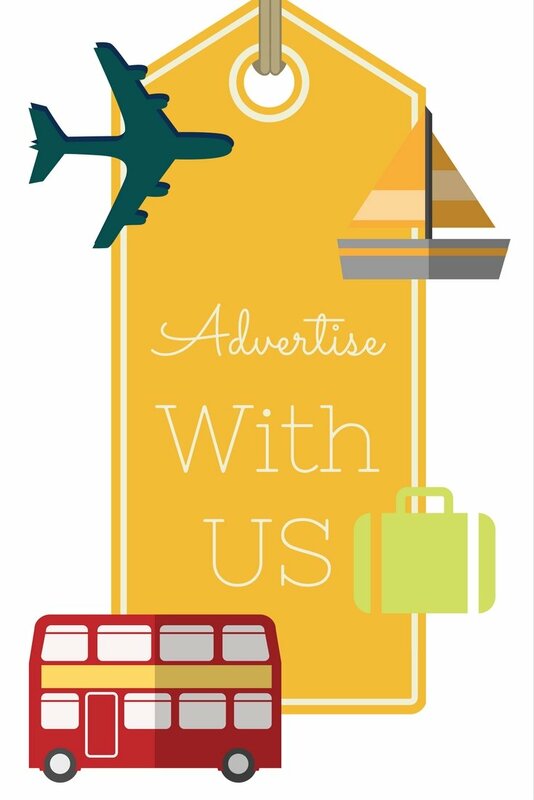 Although, when we say Acropolis, we automatically think of the Athens Acropolis, it’s important to know that every Greek town of that time had its own acropolis, for instance, you might have a chance to also see the Lindos, Rhodes acropolis as part of your Mediterranean cruise. An Acropolis was a citadel of each town, built on a naturally elevated ground for the purpose of defense. 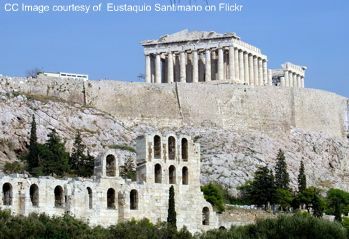 As mentioned before, the first settlements on the Athens Acropolis date back to Neolithic times, i.e. 5000 years ago. In Mycenaean times, there was a palace here and a Cyclopean massive circuit wall was built and served as the main defence for the acropolis until the 5th Ct AD. Before Classical times there were a couple of temples standing at the Acropolis, including the Older Parthenon which was still under construction when the Persians sacked the city in 480 BC and burnt and looted the building. After Athens’ victory over Persia, the Golden Age of Athens followed, during which the classical leader Pericles commissioned the rebuilding of the temples and buildings on the Acropolis, including the Parthenon, the Propylaea, the Erechtheion and the temple of Athena Nike. The two architects responsible for the construction of the Parthenon were Ictinus and Callicrates, while Phidias was in charge of sculpture. 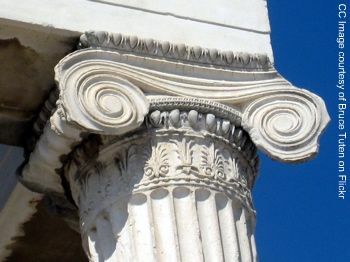 In Classical times, the power was moved down to the Agora and the Acropolis became a purely religious site. During the Hellenistic and Roman times, many of the buildings in the area of the Acropolis were fixed and with every new usurper new monuments were built and added to the complex. The last important ancient constructions were the Temple of Rome and Augustus during the Julio-Claudian period and the grand Odeon, the stone amphitheatre with a capacity of 5,000, built by Herodes Atticus. Dining-room table tidbit: Through history the Athens Acropolis became the fortress of a medieval town, the Athens Parthenon was turned into a Byzantine church, crusader cathedral, an Ottoman mosque, then a warehouse to store gunpowder which is the reason the Parthenon doesn’t have a roof anymore. Namely, it was destroyed when the gunpowder exploded during the Venetian siege. Here’s a what-is-what list and a plan of ruins that used to, or still stand, at the Athens Acropolis. 1. Parthenon – undoubtedly the rock-star of the Athens Acropolis and one of the most important architectural structures in the world. Read more about it in our article on Athens Parthenon. 2. Old Temple of Athena – archaic temple dedicated to Athena Polias, patron deity of the city. It is possible it was built on top of the remains of the Mycenean palace. 3. Erechtheum – a temple built in the 5th Ct BC, dedicated either to the legendary Greek hero Erichtonius or the legendary kind Erechteus II. Phidias was in charge of its sculpture. 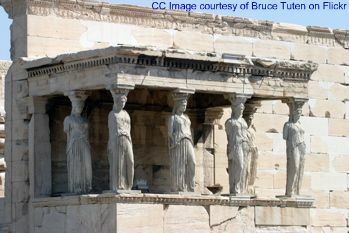 On its south side there is the famous "Porch of the Maidens", with six draped female figures (caryatids) as supporting columns. The caryatids that can be seen there today are the casts. The originals have been moved to the New Acropolis Museum to protect them from further destruction by the Athens city smog. 4. Statue of Athena Promachos – at this spot used to stand the gigantic bronze statue (7m high on top of a 2m base) of Athena goddess, patron of Athens, standing with her shield resting upright against her leg, and a spear in her right hand. The statue could be seen from the sea. It was one of the first works of Phidias. It was one of the most famous statues of antiquity. It stood overlooking the city for over 1000 years until it was deported to Constantinople in 465 and finally destroyed by a Christian mob in 1203. 5. Propylaea – the monumental entrance to the flat top of the Acropolis. It was one of the buildings built by Pericles in the 5th Ct. Besides providing security, its role was to create a dramatic first impression before seeing the Parthenon. Under Frankish occupation (1204-1456) the Propylaia were converted into a residence for the Frankish ruler, and in the Ottoman period (1456-1833) into the Turkish garrison headquarters. 6. Temple of Athena Nike – a small temple dedicated to one of many of Athena goddess’ forms, Victory. The Temple of Athena Nike was an expression of Athens' ambition to be the leading Greek city-state in the Peloponnese. 7. Eleusinion – an Athenian temple to Demeter, located at the base of the Acropolis. The Eleusinion was the place where all sacred objects associated with the Eleusinian Mysteries were kept between ceremonies. The mysteries, lasting two thousand years, were a major festival during the Hellenic era. Although the rites, ceremonies, and beliefs were kept secret, as initiation was believed to unite the worshipper with the gods and included promises of divine power and rewards in the afterlife. 8. Sanctuary of Artemis Brauronia or Brauroneion – the Brauroneion was the sanctuary of Artemis Brauronia, protector of women in pregnancy and childbirth. 9. Chalkotheke – a building that housed the treasury of Athens. It contained the bronze (chalkos) and other metal possessions of the treasury. 10. Pandroseion – this is where The Pandroseion once stood, a sanctuary dedicated to Pandrosus, one of the daughters of Cecrops I, the first king of Attica. 11. Arrephorion – it provided the lodgings for the arrephores, the girls who worked for a whole year just below the Acropolis weaving the new peplos (a body length garment worn by women) for Panathenaic procession which was the most important festival for Athens and one of the grandest in the entire ancient Greek world. This Peplos was placed on the statue of Athena during the festival procession. 12. Altar of Athena – this was a very ancient altar to Athena and Erechtheus, that was used by the various temples that replaced one another on the Acropolis. 14. Sanctuary of Pandion – the Sanctuary of Pandion was an open-air sanctuary or shrine at the southeast corner of the Acropolis of Athens. 15. Odeon of Herodes Atticus – the Odeon of Herodes Atticus is a stone theatre structure located on the south slope of the Acropolis of Athens. It has a capacity of 5,000 and is used for concerts still to this day. 16. Stoa of Eumenes – is a publicly used covered walkway or portico, used mostly for promenading. 17. Asclepeion – was a healing temple, sacred to the god Asclepius. 18. Theatre of Dionysus Eleuthereus – the Theatre of Dionysus was a major open-air theatre in Athens, one of the earliest theaters in the world, where plays were performed at festivals in honour of the god Dionysus. 19. Odeon of Pericles – a 4000 m² odeon built at the foot of the southeast part of the Acropolis in Athens, built for the musical contests that formed part of the Panathenaean festival. 20. Aglaureion – a shrine to Aglauros, one of the daughters of Cecrops, the first king of Athens, on the acropolis of Athens.